For the fictional university, see Hudson University. The Hudson Institute is a politically conservative, 501(c)(3) non-profit American think tank based in Washington, D.C. It was founded in 1961 in Croton-on-Hudson, New York, by futurist, military strategist, and systems theorist Herman Kahn and his colleagues at the RAND Corporation. To promote the discussion and exchange of ideas on issues related to national security, human rights, foreign policy, economics, and domestic policy. According to its website, the Institute is committed to innovative research and analysis that promotes "global security, prosperity and freedom." It promotes public policy change in accordance with its stated belief that "America's unique and central role in the global system offers the best foundation for security, the defense of liberty, and assuring economic growth." In March 2011, Kenneth R. Weinstein was appointed president and chief executive officer of the Hudson Institute. Hudson Institute was founded in 1961 by Herman Kahn, Max Singer, and Oscar M. Ruebhausen. In 1960, while employed at the RAND Corporation, Kahn had given a series of lectures at Princeton University on scenarios related to nuclear war. In 1960, Princeton University Press published On Thermonuclear War, a book-length expansion of Kahn's lecture notes. Major controversies ensued, and in the end, Kahn and RAND had a parting of ways. Kahn moved to Croton-on-Hudson, New York, intending to establish a new think tank, less hierarchical and bureaucratic in its organization. Along with Max Singer, a young government lawyer who had been a RAND colleague of Kahn's, and New York attorney Oscar Ruebhausen, Kahn founded Hudson Institute on 20 July 1961. Kahn was the Hudson's driving intellect and Singer built up the institute's organization. Ruebhausen was an advisor to New York Governor Nelson Rockefeller. Hudson's initial research projects largely reflected Kahn's personal interests, which included the domestic and military use of nuclear power and scenario planning exercises about present policy options and their possible future outcomes. Kahn and his colleagues made pioneering contributions to nuclear deterrence theory and strategy during this period. Hudson's detailed analyses of "ladders of escalation" and reports on the likely consequences of limited and unlimited nuclear exchanges, eventually published as Thinking About the Unthinkable (1962) and On Escalation: Metaphors and Scenarios (1965), were influential within the Kennedy administration, and helped the Institute win its first major research contract from the Office of Civil Defense at the Pentagon. Kahn did not want Hudson to restrict itself to defense-related research, and along with Singer recruited a full-time professional staff with widely different academic backgrounds. Hudson Institute regularly involved a broad range of outside notables in their analytic projects and policy deliberations. These included French philosopher Raymond Aron, African-American novelist Ralph Ellison, political scientist Henry Kissinger, conceptual artist James Lee Byars, and social scientist Daniel Bell. Hudson's focus expanded to include geopolitics, economics, demography, anthropology, science and technology, education, and urban planning. Kahn eventually expanded the use of scenario planning from defense policy work to economics, and in 1962 became the first analyst to predict the rise of Japan as the world's second-largest economy. 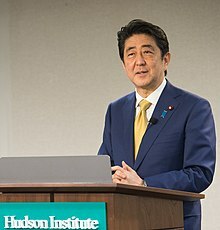 Hudson Institute's publications soon became popular in Japan and Kahn developed close ties to numerous politicians and corporate leaders there. Hudson Institute used scenario-planning techniques to forecast long-term developments and became renowned for its future studies. In 1967, Hudson published The Year 2000, a bestselling book, commissioned by the American Academy of Arts and Sciences. Many of the predictions came to pass, including technological developments like portable telephones and network-linked home and office computers. In 1970, The Emerging Japanese Superstate, elaborating Kahn’s predictions on the rise of Japan, was published. After the Club of Rome's controversial 1972 report The Limits to Growth produced widespread alarm about the possibility that population growth and resource depletion might result in a 21st-century global "collapse", Hudson responded with an analysis of its own, The Next 200 Years, which concluded, instead, that scientific and practical innovations were likely to produce significantly better worldwide living standards. Maintaining this optimism about the future in his 1982 book The Coming Boom, Kahn argued that pro-growth tax and fiscal polies, an emerging information technology revolution, and breakthrough developments in the energy industry would make possible a period of unprecedented prosperity in the Western world by the early 21st century. Kahn was among the first to foresee unconventional extraction techniques like hydraulic fracturing. Within 20 years, Hudson had become an international think tank with offices in Bonn, Paris, Brussels, Montreal and Tokyo. Other research projects were related to South Korea, Singapore, Australia and Latin America. Following Kahn's sudden death on July 7, 1983, Hudson was restructured. Actively recruited by the City of Indianapolis and the Lilly Endowment, Hudson relocated its headquarters to Indiana in 1984. In 1987, Mitch Daniels, a former aide to Senator Richard Lugar (R-IN) and President Ronald Reagan, was appointed CEO of Hudson Institute. Daniels recruited new scholars and experts to the Institute. William Eldridge Odom, former Director of the National Security Agency, became Hudson's director of national security studies; economist Alan Reynolds became director of economic research. Technologist George Gilder led a project on the implications of the digital era for American society. In 1990, Daniels left Hudson Institute to become Vice President of Corporate Affairs at Eli Lilly and Company. He was succeeded as CEO by Leslie Lenkowsky, a social scientist, and former consultant to Senator Daniel Patrick Moynihan. Under Lenkowsky, Hudson put an emphasis on domestic and social policy. In the early 1990s, the Institute did work on education reform and applied research on charter school and school choice. At the initiative of Wisconsin Governor Tommy Thompson, Hudson designed the "Wisconsin Works" welfare-to-work program that was adopted nationwide in the 1996 federal welfare-reform legislation signed by President Bill Clinton. In 2001, President George W. Bush's initiative on charitable choice was based on Hudson's research into social-service programs administered by faith-based organizations. Other Hudson research from this period included 1987's "Workforce 2000", the best-selling think tank study of its day, which predicted the transformation of the American labor market and workplace arising from diversification and computerization, the "Blue Ribbon Commission on Hungary" (1990) and "International Baltic Economic Commission" (1991–93), which made major contributions to the adoption of market-oriented reforms in the newly independent states of Eastern Europe, and the 1997 follow-up study "Workforce 2020". After the September 11 attacks, Hudson focused its efforts on international issues such as the Middle East, Latin America and Islam. On 1 July 2004, Hudson relocated its headquarters to Washington, DC, and focused its research on national security and foreign policy issues. Based on the conviction that the internet must also follow the core requirements for a functioning market, the Center for the Economics of the Internet focuses its program on research and debate intended to show the importance and use of property and contract rights throughout the digital world. The center rejects "internet exceptionalism", where property rights, contract rights, and competition are not important, where "ordinary principles of economics do not apply", and where the government has a responsibility to regulate with unusual intensity and without limitations. The center is directed by Harold Furchtgott-Roth, joined by senior fellow Robert M. McDowell. Led by Director Hillel Fradkin, the Center on Islam, Democracy, and the Future of the Muslim World conducts a variety of research programs and convenes public conferences covering a wide range of topics such as religious culture and intellectual developments affecting Islamic countries and Muslim-minority populations worldwide. The center's goal is to identify and encourage moderate and democratic alternatives to sectarian radicalism. One of the center's core projects is "Current Trends in Islamist Ideology", published since 2005. It is edited by Hillel Fradkin and Hudson senior fellows Husain Haqqani and Eric Brown, along with Hassan Mneimneh, Senior Transatlantic Fellow for MENA and the Islamic World at the German Marshall Fund. Founded in 1986 and housed at Hudson Institute since January 2007, the Center for Religious Freedom works with a broad range of experts in order to promote religious freedom as an integral element of U.S. foreign policy. When U.S. foreign policy is lagging behind in that regard, the center strives to defend persecuted believers and to promote religious freedom worldwide. From its inception in 1986, the center has sponsored investigative field missions, published reports on the religious persecution of various individuals and groups, and taken action on their behalf in the media and with relevant officials in Congress and the executive branch. During the Cold War, the Center's efforts were focused on helping religious believers that were persecuted under communism. Today, the center has broadened its efforts to promote religious freedom for citizens in autocratic regimes of any sort, especially in the Muslim world. The center is directed by Nina Shea and includes among its scholars senior fellows Paul Marshal and Samuel Tadros, and adjunct fellow Lela Gilbert. The Center for Global Prosperity is focused on creating awareness among opinion leaders and the general public about the crucial role of the private sector (both for-profit and not-for-profit) as a main source of countries’ economic growth and prosperity. The center's signature product is the annual Index of Global Philanthropy and Remittances, which details the sources and amounts of private giving to the developing world. The center’s work is rooted in support for free societies—functioning capital markets, private property, free trade and press, the rule of law, good governance, and human rights—as the principal basis for economic prosperity and well-being. Its pilot study, Philanthropic Freedom, was the first comprehensive analysis of global philanthropic freedom, examining barriers and incentives for individuals and organizations to spend resources on social causes. The center is headed by Carol Adelman, and its staff includes senior fellow Jeremiah Norris. Dedicated to sustaining America’s ability to develop welfare-increasing technological innovations, Hudson Institute's Initiative on Future Innovation sponsors original, problem-solving research to improve the basis for productive scientific inquiry and for the rapid implementation of new discoveries and inventions. The initiative is directed by Christopher DeMuth, a distinguished fellow at Hudson and former president of the American Enterprise Institute. Directed by senior fellow Hank Cardello, the Obesity Solutions Initiative focuses on improving policies and developing solutions to address the global obesity epidemic. The initiative's main focal point is the development of market-based solutions taking into consideration the interests of the public health community, consumers, regulators, and the private sector. It criticizes current obesity approaches as having a one-sided perspective, suffering from a lack of pragmatism, and being ineffective and costly. The initiative's overall objective is to build the business case for healthier, lower-calorie foods by illustrating the financial and marketing benefits of such products. The center is developing policies that are based on tax incentives to lower the number of calories being sold, and the balancing of marketing budgets in order to educate consumers about portion control and nutrition. The center values small, local and often faith-based grassroots associations as core elements of a vital civil society and aims to encourage foundations and charitable donors to put more emphasis on supporting these organizations. Through research, publications, and seminars, the center examines the current giving practices of American foundations. According to the center, U.S. foundations tend to support larger, expert-driven projects while largely ignoring smaller civic associations. The center conducts discussions about these issues throughout the non-profit sector and also advises donors on creating grant-making programs that support a renewal of civil society. Hudson senior fellow William A. Schambra has directed the Center since its launch in 2003. The Center was named after its longtime principal donor, the Lynde and Harry Bradley Foundation, and also for the National Commission on Philanthropy and Civic Renewal of 1996–97. The Center for American Seapower works for the promotion of public dialogue on America's shrinking maritime power and provides arguments and strategies in order to strengthen the U.S. Navy, Marine Corps, and Coast Guard as well as the American shipbuilding industries. Directed by senior fellow Seth Cropsey and adjunct fellow Bryan McGrath, the center works on developing alternative maritime strategies, makes detailed evaluation of the threats posed by the rise of local and potential global maritime competitors, and takes into account both historical and current events in order to assess the longer-term impact of diminishing U.S. sea power on the country's national security. The Center for Substance Abuse Policy Research is searching for ways to build sustained public awareness of the dangers of substance abuse, and supports new strategies verified by science, medicine, and actual practice. In the center's view, U.S. federal drug policy is in disarray, challenged by budgetary constraints and unclear goals. Currently, U.S. drug abuse is on the rise, as are the associated secondary consequences, and core policy principles are being threatened. As a result, the center aims to correct misinformation, document the harm done by drug abuse, present scientific countermeasures, and present necessary and relevant information to key federal, state, and local policymakers. The center is directed by John P. Walters, Hudson Institute's COO, and senior fellow David W. Murray. The Kleptocracy Initiative (KI) investigates the increasing threats posed to Western democracies by autocratic regimes. KI analyses the financial practices of autocratic governments and their leaders, and focuses on designing new and effective policies in order to prevent hostile foreign actors from secretly stealing their nations' assets and using those assets against their own citizens, the U.S. and its allies. The initiative is led by Executive Director Charles Davidson and Media Director Julie Davidson. Politicians who have been affiliated with Hudson include former U.S. Vice President Dan Quayle and Governor of Indiana Mitch Daniels, who served as Hudson's President and CEO from 1987 to 1990. Critics question the institute's negative campaigning against organic farming, since it receives large sums of money from conventional food companies. The New York Times commented on Dennis Avery's attacks on organic farming: "The attack on organic food by a well-financed research organization suggests that, though organic food accounts for only 1 percent of food sales in the United States, the conventional food industry is worried." After it was revealed that Michael Fumento received funding from Monsanto for his 1999 book Bio-Evolution, company spokesman Chris Horner confirmed that it continues to fund the think tank. "It's our practice, that if we're dealing with an organization like this, that any funds we're giving should be unrestricted," Horner told BusinessWeek. Hudson's CEO and President Kenneth R. Weinstein told BusinessWeek that he was uncertain if the payment should have been disclosed. "That's a good question, period," he said. ^ a b "Hudson Institute, Inc." Division of Corporations. New York State Department of State. Retrieved October 30, 2017. ^ a b c d e "Form 990: Return of Organization Exempt from Income Tax". Hudson Institute Inc. Guidestar. December 31, 2015. ^ "Hudson Institute Inc". Exempt Organizations Select Check. Internal Revenue Service. Retrieved October 30, 2017. ^ a b c d "About - Leadership". Hudson Institute. Retrieved October 30, 2017. ^ a b c d "2017 Annual Report" (PDF). Hudson Institute. 31 December 2017. Retrieved 14 June 2018. ^ a b c d Obe, Mitsuru (23 September 2013). "Abe First Non-American to Win Conservative Hudson Institute Award". The Wall Street Journal. Retrieved 4 July 2016. ^ "About - Hudson Institute". Hudson Institute. Retrieved 2015-06-23. ^ "Mission Statement". Hudson Institute. Retrieved 2015-06-23. ^ "Experts – Kenneth R. Weinstein". Hudson Institute. Retrieved 2015-06-23. ^ "History". Hudson Institute. Retrieved 4 July 2016. ^ a b c d Menand, Louis (27 June 2005). "Fat Man". The New Yorker. Retrieved 24 January 2017. ^ "About the book". BookFinder.com. Retrieved 4 July 2016. ^ Paul Dragos Aligica, Kenneth R. Weinstein (31 December 2008). The Essential Herman Kahn: In Defense of Thinking. Lexington Books. p. 269. ISBN 978-0739128299. ^ Neil Pickett (April 1993). A History of Hudson Institute (PDF). Indianapolis: Hudson Institute. p. 5. ^ a b Neil Pickett (April 1993). A History of Hudson Institute (PDF). Indianapolis: Hudson Institute. p. 6. ^ Douglas, Martin (12 December 2004). "Oscar M. Ruebhausen, 92, Former Rockefeller Adviser". The New York Times. Retrieved 4 July 2016. ^ Nicola Sayers (January 2010). A Guide to Scenario Planning in Higher Education. London: Leadership Foundation for Higher Education. p. 3. ISBN 978-1906627171. ^ Dor On, Ami (14 August 2013). "The New, Dangerous Middle East". Israeli Homeland Security. Retrieved 4 July 2016. ^ Nusbacher, Lynette (29 August 2012). "Herman's Ladder: Climbing up and Climbing Down". The Times of Israel. Retrieved 4 July 2016. ^ Sempa, Francis P (28 May 2015). "Does The U.S. Need to Revive Its Nuclear Strategy?". The Diplomat. Retrieved 4 July 2016. ^ Kifner, John (30 January 1999). "L. C. Lewin, Writer of Satire Of Government Plot, Dies at 82". The New York Times. Retrieved 4 July 2016. ^ Brown, William M. (2 August 1965). "A New Look at the Degign of Low-Budget Civil Defense Systems" (PDF). Defense Technical Information Center. Retrieved 4 July 2016. ^ Neil Pickett (April 1993). A History of Hudson Institute (PDF). Indianapolis: Hudson Institute. p. 12. ^ a b Neil Pickett (April 1993). A History of Hudson Institute (PDF). Indianapolis: Hudson Institute. p. 7. ^ Duval, Steven J. (29 January 2014). "James Lee Byars and the Hudson Institute". ARC (Arts Research Collaboration at the Spencer Museum of Art, University of Kansas). Retrieved 25 February 2019. ^ a b Martin, Douglas (26 June 2012). "Anthony J. Wiener, Forecaster of the Future, Is Dead at 81". The New York Times. Retrieved 4 July 2016. ^ "Corporate Envirenment Program" (PDF). Gerald R. Ford Presidential Library. September 1974. Archived from the original (PDF) on 21 August 2016. Retrieved 4 July 2016. ^ Gagnon, Paul (1 March 1978). "Our Children's Crippled Future, by Frank E. Armbruster with Paul Bracken". Commentary. Retrieved 4 July 2016. ^ a b c Kovner, Bruce (1 December 1976). "The Next 200 Years, by Herman Kahn, William Brown, and Leon Martel; RIO: Reshaping the International Order, edited by Jan Tinber". Commentary. Retrieved 4 July 2016. ^ Pesner, Jeremy (3 May 2016). "How to Predict the Future(s)". The Huffington Post. Retrieved 4 July 2016. ^ a b Neil Pickett (April 1993). A History of Hudson Institute (PDF). Indianapolis: Hudson Institute. p. 15. ^ Ratcliffe, John (1 January 2000). "Scenario Building: a Suitable Method for Strategic Property Planning?". Dublin Institute for Technology. Retrieved 4 July 2016. ^ Albright, Richard E. (January 2002). "What Can Past Technology Forecasts Tell Us About the Future" (PDF). Albright Strategy. Retrieved 4 July 2016. ^ Passell, Peter (12 September 1982). "Why is Herman Kahn Smiling?". The New York Times. Retrieved 4 July 2016. ^ Grier, Peter (5 November 1982). "Why Herman Kahn sees a bright economic future ahead". The Christian Science Monitor. Retrieved 4 July 2016. ^ Parisi, Anthony J. (26 February 1978). "Herman Kahn Revisited". The New York Times. Retrieved 4 July 2016. ^ Johnston, William B. (June 1987). "Workforce 2000" (PDF). Institute of Education Sciences. Retrieved 4 July 2016. ^ Neil Pickett (April 1993). A History of Hudson Institute (PDF). Indianapolis: Hudson Institute. p. 16. ^ Neil Pickett (April 1993). A History of Hudson Institute (PDF). Indianapolis: Hudson Institute. p. 2. ^ Neil Pickett (April 1993). A History of Hudson Institute (PDF). Indianapolis: Hudson Institute. p. 17. ^ Neil Pickett (April 1993). A History of Hudson Institute (PDF). Indianapolis: Hudson Institute. p. 20. ^ "Measure" (PDF). Hewlett-Packard. March 1970. Retrieved 4 July 2016. ^ Teaster, Joseph B (8 July 1983). "Herman Kahn dies; Futurist and Thinker on Nuclear Strategy". The New York Times. Retrieved 18 November 2016. ^ Feron, James (18 May 1984). "Hudson Institute Moving to Midwest". The New York Times. Retrieved 18 November 2016. ^ Neil Pickett (April 1993). A History of Hudson Institute (PDF). Indianapolis: Hudson Institute. p. 31. ^ a b Neil Pickett (April 1993). A History of Hudson Institute (PDF). Indianapolis: Hudson Institute. p. 32. ^ Kingston, Margo (3 May 2004). "Is US withdrawal the least worst option?". The Sydney Morning Herald. Retrieved 18 November 2016. ^ Odom, William E. (21 April 1991). "Heavy Portents in Korean Gambit : Gorbachev's visit to Roh Tae Woo, not limited results in Tokyo, offers the best clues to his Asian strategy". Los Angeles Times. Retrieved 18 November 2016. ^ "Alan Reynolds". U.S.News. Retrieved 18 November 2016. ^ Andrews, Paul (30 October 1990). "Fiber Optics Called Key To New Era". The Seattle Times. Retrieved 18 November 2016. ^ Gilder, George (March–April 1991). "Into the Telecosm". Harvard Business Review. Retrieved 18 November 2016. ^ "Curriculum Vitae for Mitchell E. Daniels, Jr". Purdue University. Retrieved 18 November 2016. ^ a b Miller, John J. (2003). "Strategic Investment in Ideas" (PDF). PhilanthropyRoundtable. Retrieved 18 November 2016. ^ "Curriculum Vitae" (PDF). Indiana University Bloomington. Retrieved 18 November 2016. ^ Celis, William (20 December 1992). "A Would-Be Model for Reviving Ailing Public Schools". The New York Times. Retrieved 18 November 2016. ^ Hook, Ormand G. (6 January 1997). "Let's Get the Facts Straight on Charter Schools". Mackinac Center. Retrieved 18 November 2016. ^ "THE 3-MINUTE INTERVIEW: Kenneth R. Weinstein". Washington Examiner. 7 November 2011. Retrieved 18 November 2016. ^ Jouzaitis, Carol (30 September 1996). "Welfare Reform: Now It's Up To States". Chicago Tribune. Retrieved 18 November 2016. ^ Burke, Vee (9 August 2004). "Charitable Choice, Faith-Based Initiatives, and TANF" (PDF). Oswego State University of New York. Retrieved 18 November 2016. ^ "Charitable Choice" (PDF). United States General Accounting Office. January 2002. Retrieved 16 November 2016. ^ Sherman, Amy L. "Empowering Compassion" (PDF). Faith in Communities. Retrieved 18 November 2016. ^ a b D'Amico, Carol. "Back to the future: A current view of workforce 2000 and projections for 2020". BookSC. Archived from the original on 18 November 2016. Retrieved 18 November 2016. ^ Uchitelle, Louis (15 January 1990). "U.S. Foundations Seek an East Bloc Role". The New York Times. Retrieved 18 November 2016. ^ Kusmer, Ken (28 October 1991). "Quayle Signs Agreement to Spur Private Investment in Baltics". AP News Archive. Retrieved 18 November 2016. ^ "The Hudson Institute". Laurel Hall. Retrieved 18 November 2016. ^ "Former FCC Commissioner Launches Free-Market Think Tank". Nationaljournal.com. Retrieved 2015-05-29. ^ "Furchtgott-Roth: Title II Could Mean Internet 'Stealth' Tax". multichannel.com. ^ "COMMISSIONER ROBERT M. McDOWELL ANNOUNCES HE WILL JOIN THE HUDSON INSTITUTE'S CENTER FOR ECONOMICS OF THE INTERNET AS A VISITING FELLOW" (PDF). Transition.fcc.gov. Retrieved 2015-05-29. ^ "Center for the Economics of the Internet". Hudson Institute. Retrieved 10 January 2015. ^ "The War on Terrorism: Osama bin Laden and al-Qa'ida – Joyner Library". ecu.edu. ^ "9/11: What else it taught us". Boston.com. ^ "Pakistan must give up its obsession with Kashmir: Ex-envoy Husain Haqqani". timesofindia-economictimes. ^ "Beijing's Islamic Complex". The American Interest. ^ "Current Trends in Islamist Ideology". Hudson Institute. Retrieved 10 January 2015. ^ "Preview: R&L Interviews Nina Shea". Acton Institute PowerBlog. ^ "Center for Religious Freedom". georgetown.edu. ^ "Syrian Christians ask Congress: Why is U.S. waging war on us?". The Washington Times. ^ Los Angeles Times (19 February 2015). "Islamic State's horrible healing power in Egypt". latimes.com. ^ "Center for Religious Freedom". Hudson Institute. Retrieved 10 January 2015. ^ Nick Morrison (18 January 2015). "If Business Wants Better Schools, It Should Dig Deeper". Forbes. ^ "Study: U.S. Leads in Private, Charitable Giving". ZENIT – The World Seen From Rome. ^ "Australia Rates High in Philanthropic Freedom". probonoaustralia.com.au. ^ Capital Flows. "Saudi Arabia's Deportation Of Foreign Workers Will Exacerbate Middle Eastern Economic Weakness". Forbes. ^ "Private charity outpaces, outperforms foreign aid". The Washington Times. ^ "Center for Global Prosperity". Hudson Institute. Retrieved 10 January 2015. ^ "Open Skies and Open Spectrum". National Review Online. ^ "Former AEI president Christopher DeMuth leaves for Hudson Institute". Washington Post. ^ "Initiative on Future Innovation". Hudson Institute. Retrieved 14 January 2015. ^ Rachel Chason (12 June 2014). "Food labels no guarantee of healthier choices". USA TODAY. ^ "Cookie Monster Crumbles" (PDF). Economist.com. Retrieved 2015-05-29. ^ Hank Cardello. "Calling Obesity a Disease Decreases Incentives to Eat Healthier". US News & World Report. ^ "How the Food Industry Can Solve Our Childhood Obesity Crisis". The Atlantic. ^ "Obesity Solutions Initiative". Hudson Institute. Retrieved 14 January 2015. ^ William Schambra. "Saving John's Carpet House, Saving Civil Society?". nonprofitquarterly.org. ^ "Nonprofit Sector Research Fund : Working Paper Series" (PDF). TCenterforgiving.org. Retrieved 2015-05-29. ^ Bill Schambra and Lisa Gilbert. "Both Left and Right agree: IRS should clarify political rules for nonprofits". Washington Examiner. ^ William Schambra. "The Tyranny of Success: Nonprofits and Metrics". nonprofitquarterly.org. ^ "Bradley Center for Philanthropy & Civic Renewal". Hudson Institute. Retrieved 14 January 2015. ^ "Thomas Stewart: ISIS may herald return of the Barbary Pirates". The Washington Times. ^ "Fate of the Tomahawk cruise missile". TheHill. ^ "Center for American Seapower". Hudson Institute. Retrieved 14 January 2015. ^ "Marijuana legalization undermines Obama administration's health goals". TheHill. ^ John P. Walters and David W. Murray. "Drug testing welfare recipients: punitive or humane?". The Washington Times. ^ "Center for Substance Abuse Policy Research". Hudson Institute. Retrieved 14 January 2015. ^ "Kleptocracy Initiative". Hudson Institute. Retrieved 14 January 2015. ^ "Leadership". Hudson Institute. Retrieved 11 December 2018. ^ "Hudson Upcoming Events Detail". Hudson Institute. 2010-10-14. Archived from the original on 2012-03-05. Retrieved 2012-04-26. ^ "The year 2000; a framework for speculation on the next thirty-three years,". University of Toronto. Retrieved 24 January 2017. ^ McDuffe, Allen (19 December 2012). "Judge Robert Bork, prominent conservative figure and Hudson Institute fellow, dies at 85". The Washington Post. Retrieved 24 January 2017. ^ "Rudy Boschwitz". Bloomberg. Retrieved 24 January 2017. ^ "President-Elect Donald J. Trump to Nominate Elaine Chao as Secretary of the Department of Transportation". GreatAgain. 29 November 2016. Retrieved 7 February 2017. ^ Rubin, Jennifer (14 December 2016). "Obama repeated Ike's mistakes so will Trump repeat Obama's?". The Washington Post. Retrieved 29 March 2017. ^ "Pierre S. du Pont". Bloomberg. Retrieved 24 January 2017. ^ "United Technologies Calls on Haig Again". The New York Times. 7 September 1982. Retrieved 24 January 2017. ^ Lee, Don (2 December 2015). "Is it time to lift the 40-year-old ban on U.S. crude oil exports?". Los Angeles Times. Retrieved 29 March 2017. ^ Meyssan, Thierry (10 January 2017). "Could Turkey swing over to the Russian camp?". Voltairenet. Retrieved 24 January 2017. ^ Goldsborough, Bob (14 September 2015). "Amy Kass, taught literature at University of Chicago, dies". Chicago Tribune. Retrieved 24 January 2017. ^ Neil Pickett (April 1993). A History of Hudson Institute (PDF). Indianapolis: Hudson Institute. p. 8. ^ "Walter Russell Mead On Jacksonianism, Foreign Policy, And American Elites". The Federalist. 22 December 2017. Retrieved 7 February 2017. ^ Ghattas, Kim (12 January 2009). "Countries that will miss George Bush". BBC. Retrieved 29 March 2017. ^ Odom, William E. (31 October 2006). "How to cut and run". Los Angeles Times. Retrieved 24 January 2017. ^ Chapin, Bernard (9 January 2007). "An Interview with John O'Sullivan". The American Spectator. Retrieved 24 January 2017. ^ Marcello, Pera. "curriculum vitae". Retrieved 29 March 2017. ^ Shi, Thing (10 December 2016). "For China, Trump's Style Brings Optimism Even as Rhetoric Bites". Bloomberg. Retrieved 29 March 2017. ^ "Oxford University must stop selling its reputation to Vladimir Putin's associates". The Guardian. 3 November 2015. Retrieved 29 March 2017. ^ Prosor, Ron (27 June 2016). "UN's Moral Ban-Kruptcy". The Huffington Post. Retrieved 29 March 2017. ^ Radosh, Ron (25 March 2016). "How an obscure socialist text from the '80s predicted Bernie Sanders's rise". The Washington Post. Retrieved 29 March 2017. ^ "William H. Schweitzer". Bloomberg. Retrieved 12 January 2017. ^ Ramani, Samuel (29 March 2017). "Interview With Noted Journalist and Russia Expert, David Satter". The Huffington Post. Retrieved 29 March 2017. ^ Smith, David (16 January 2017). "'It's crazy to think that I'd threaten Blair'". The Guardian. Retrieved 24 January 2017. ^ "Conflicting strategies? Ft. Richard Weitz, Senior Fellow, Hudson Institute". RT television network. 17 May 2015. Retrieved 17 January 2017. ^ Curtin Winsor Archived June 2, 2006, at the Wayback Machine Hudson Institute Biography. ^ Marian Burros, "Eating Well; Anti-Organic, And Flawed", The New York Times, accessed December 14, 2007. ^ Javers, Eamon (2006-01-13). "A Columnist Backed by Monsanto". BusinessWeek. Retrieved 2012-04-26. Kirkpatrick, David D. "Lack of Resolution in Iraq Finds Conservatives Divided". The New York Times, April 19, 2004: A21.